What would have happened in Ferguson on that hot August afternoon had a social worker come upon Michael Brown on Canfield Avenue? What if a social worker saw Eric Garner selling loose cigarettes in the Tompkinsville neighborhood of Staten Island? My hunch is that they’d both be alive today. [NOTE: This is an updated version of a post from December 14, 2014. 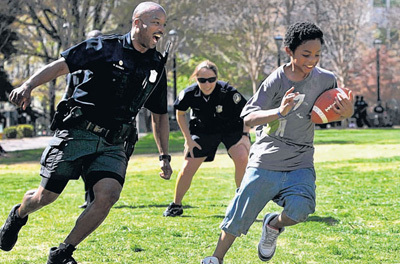 Community policing is a philosophy that promotes organizational strategies, which support the systematic use of partnerships and problem-solving techniques, to proactively address the immediate conditions that give rise to public safety issues such as crime, social disorder, and fear of crime. I went to the Occasional Planet’s Director of Plain Speaking who said that what it means is a cop with a heart. Well, there’s probably more to it than that and we don’t wish to imply that most cops do not have a heart. An effective community police officer has much the knowledge of a social worker such as what approach to take when an individual or a group of people are truly upset about something. He or she is also someone who can brainstorm solutions to seemingly difficult situations. Whether they are on the “mean streets” of the inner city or closeted away in the hidden lanes of the farthest suburbs, there is essential work that community police officers can do. Several days ago I was working with a group of inner city student about to enter high school. We were talking about the recent events in Baton Rouge, St. Paul, Dallas and elsewhere in the United States. One of the questions we asked was whether any of them had had any positive experiences with police officers. About a quarter of the class raised their hands and had encouraging stories to tell. One boy spoke of a day when he was playing catch with himself with a football. The ball got away from him and rolled out into the street. The boy said that a police officer drove up, and naturally he was scared. What ensued was that the officer stopped his car, got out, retrieved the ball, and tossed it back to him. The policeman did not reprimand him, rather he urged the boy to enjoy his play and to be safe. We do have numerous examples of community policing, in both our actual history and fictional history. Remember the beat cop that actor Sean Connery played in The Untouchables. He was a guy who would befriend you on the street, but when necessary bop you upside the head with his night stick. From the 1960s through the 1980s, many police forces made efforts to hire an “Officer Friendly.” While much of the work of these officers was visiting pre-school and kindergarten classes, they also were present at a number of events where they could mingle with the public. But one Officer Friendly does not make a friendly police force. Why is it difficult for some police officers and many of their supporters to pick up the nuanced meaning of Black Lives Matter? It’s easy for anyone to say that all lives matter, but it becomes a throwaway line when intended to imply that everyone’s life is in equal jeopardy. Police officers are aware of the statistics showing that African-Americans are much more likely to die from gunshots, from disease, even from the hands of police. But if those officers’ only engagement with the African-American community is with a criminal element, then it can easily follow that they have a lower regard for African-American lives. On the other hand, when officers are on the streets in both good times and bad times, they get to see a more realistic picture of the community. When they can informally interact with citizens, they get to know people in a way that goes beyond stereotypes. And if officers were to get to know individuals and families in a way that social workers do, the officers might see their roles entirely differently. They would become problem-solvers in a much broader way than they are under the current definitions of their jobs. In a perfect world, we would neither need police officers nor social workers. But people have problems. Sometimes they can be addressed with love and compassion; other times they require physical restraint. The way out society is currently structured, we have different professions to address different problems. But who determines under what category a problem falls? Really there is no one. What we need are individuals who have skill sets of both police officers and social workers. The fact that this is currently possible in only a few locales does not make it an unworthy goal. We need to put our efforts towards creating a new group of community police officers who are resourceful, compassionate, and also firm when needed. So I’ve come here to Camden to do something that might have been unthinkable just a few years ago — and that’s to hold you up as a symbol of promise for the nation. (Applause.) Now, I don’t want to overstate it. Obviously Camden has gone through tough times and there are still tough times for a lot of folks here in Camden. But just a few years ago, this city was written off as dangerous beyond redemption — a city trapped in a downward spiral. Parents were afraid to let their children play outside. Drug dealers operated in broad daylight. There weren’t enough cops to patrol the streets. So two years ago, the police department was overhauled to implement a new model of community policing. They doubled the size of the force — while keeping it unionized. They cut desk jobs in favor of getting more officers out into the streets. Not just to walk the beat, but to actually get to know the residents — to set up basketball games, to volunteer in schools, to participate in reading programs, to get to know the small businesses in the area. If the system that we have elsewhere for policing is flawed, then perhaps it has to do with those whom we recruit to become police officers and how we define their jobs. We need to recruit individuals who have more of a holistic view of society rather than one limited to dividing us into “good guys” and “bad guys.” We need people who see their role as being arbiters on the streets of their community. We need people who represent the best of our societal values to the many varied kinds of people whom they encounter. In order to do this, we are going to have to pay community police officers more. We’re also going to have to improve their working conditions so that there is more joy and less trauma. We’re going to have to set expectations so that they receive high regard from the public when they earn it; not just because they wear a badge. These ideas are not particularly new; they’re just ones that were frequently thrown in the trash heap during the era of a singular focus on law and order. When the primary representatives of “we the people” who interact with citizens are solely hell-bent on keeping law and order, we should expect more than occasional miscarriage of justice. If Ferguson, Baton Rouge and St. Paul have taught us anything about policing, it’s that we need to thoroughly re-think it. Let’s start with community policing. Previous Post:Infographic: Are you really going to move to Canada if Trump wins?